British extreme metal veterans CRADLE OF FILTH will make their long-awaited triumphant return to North America with a headlining tour this March/April. Support on the trek will come from the Ukrainian metal band JINJER. 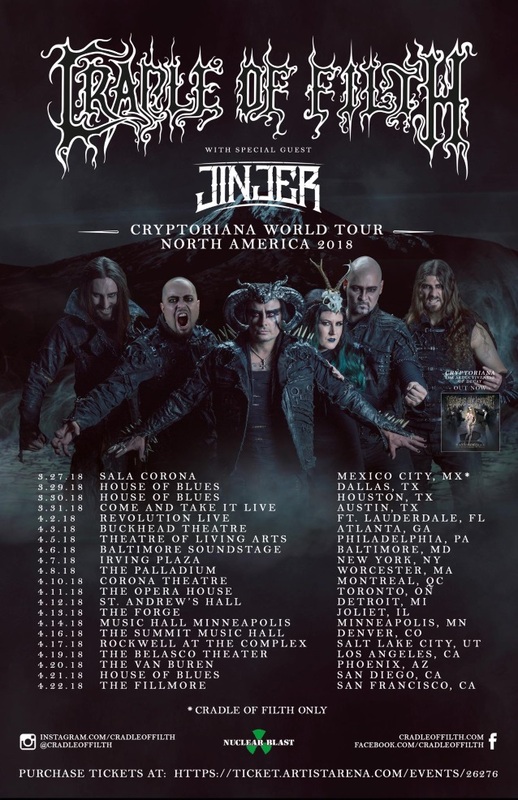 “CRADLE OF FILTH are very much looking forward to the U.S/ Canadian leg of the ‘Cryptoriana’ world tour,” commented vocalist Dani Filth. “Even more so now that we have just finished the extremely successful U.K. run, and with a huge European run ahead of us the band will be totally up to speed, firing on all cylinders and playing a cool, yet eclectic set from the new album and beyond (the extensive ‘Bathory Aria’ from ‘Cruelty And The Beast’ now being a firm fan favorite). A special BLABBERMOUTH.NET presale will begin on Tuesday, November 28 at 10:00 a.m. local time and end on Thursday, November 30 at 10:00 p.m. local time. When prompted, type in the presale code “BLABBERMOUTH” to access tickets before the general public. The general on-sale for U.S. dates is Friday, December 1 at 10:00 a.m. local time. CRADLE OF FILTH‘s 12th album, “Cryptoriana – The Seductiveness Of Decay”, was released on September 22 via Nuclear Blast. The disc was recorded at Grindstone Studios, Suffolk, U.K. by the very honorable Scott Atkins, who has been the resident go-to producer for CRADLE OF FILTH for several albums. Dani Filth sat in during the mix, serving up flaming mugs of teas, making the studio couch his own and lending his ears when necessary.